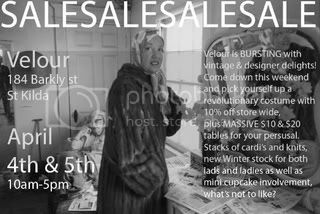 It turns out we're a little too loaded up with amazing stock, so come down and grab a bargain + check out all the new tidbits with everything being reduced for just a couple of days! There will also be accompanying cupcakes and nibblies for sustenance in those exhaustive turbo shopping times, and the fitting debut of a little project Ive been working on for the Easter window-more on that soon. Note: To make my somewhat ineffective advertising relevant please seek out Grey Gardens immediately. Do you know - I've actually seen that movie! I found it rather sad, although I would have loved to help sort through their old wardrobes! Is that terrible? I shall be popping down to look at your goodies very shortly! Oh I just adore it! Haha i'd gladly accompany you on said wardrobe rummage. Little Edie was so gorgeous when she was young, she'd have some AMAZING pieces. They're actually shooting a film based on the doco now with Drew Barrymore and Jessica Lange, I think it's a rather silly thing to do.